The island of Hawaii, or the "Big Island" takes up more than half of the area of the state of Hawaii. It is a very beautiful and fascinating place to visit. Hawaii Volcanoes National Park is located on the island as are the famous mountains of Mauna Loa and Mauna Kea. The two main towns on the island are Kailua Kona (often called just Kona) and Hilo. Kailua Kona is on the western side of the island and is known for its good weather and beautiful water. Hilo is on the eastern half of the island and is another popular place to stay. 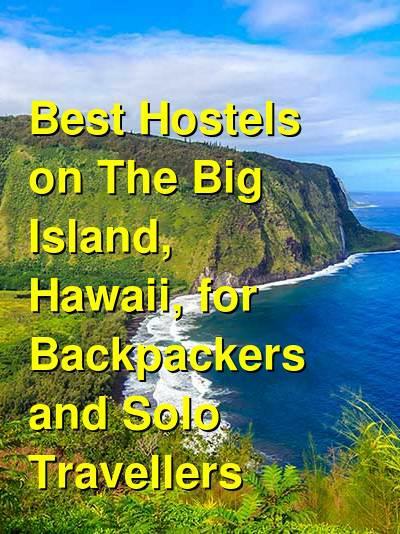 Accommodation in general is expensive in Hawaii, but there are a couple of hostels on the Big Island that offer affordable options for budget travelers and backpackers. If you're looking for a simple, comfortable and social place to stay, then a hostel might be your best bet. A good hostel in Kailua Kona for backpackers, solo travellers, and couples. My Hawaii Hostel is located in the town of Kailua Kona. It's an affordable and comfortable place to stay that offers anything a budget traveler might need. The hostel is centrally located about three miles south of the center of town and it offers easy access to several of the area's most popular beaches along Ali'i Drive. From the hostel you can walk to all kinds of restaurants, coffee shops, and beaches. The hostel has several great areas where guests can relax. There's an indoor/outdoor lounge that is the perfect place to hang out and meet other guests. There's also a self service kitchen and barbecue area if you want to prepare your own meals. This can dramatically help with travel costs as food in Hawaii can be quite expensive. There's also a secure area where you can store your bike, surfboard, or luggage. The hostel has double rooms as well as four and eight bed dorms. Female only and co-ed rooms are both available. There are shared bathrooms or en-suite bathrooms available and every bed has its own security locker. Guests also have their own reading lamp, fan, and comfortable bedding. Rooms are air conditioned and the hostel also has wi-fi throughout. A good hostel in Kailua Kona for backpackers and solo travellers. Koa Wood Hale is another conveniently located hostel in Kailua Kona and is just a short walk from the center of town as well as the beach. The hostel has all kinds of amenities available for guests including free wi-fi throughout, a public computer and printer, all kinds of travel information, and laundry facilities. There are also several great places where guests can hang out. There's a television room with a dvd player and movies, a book exchange, and a common area where many guests enjoy relaxing and chatting. The hostel also has a full shared kitchen which guests can use to prepare their own meals. There are two dorm rooms to choose from. There's a female only room with four beds and a co-ed dorm with five beds. There are also five semi-private rooms. These rooms share some space, but also have privacy available. This hostel has a wonderful staff that can help you with anything you might want to see or do. They can also loan you anything you might have forgotten. Beach towels, tents, snorkel equipment, sunscreen, umbrellas, and first aid equipment are all available. If you're looking for a relaxing but fun environment, then this is a great and affordable option on the Big Island. Hilo Bay Hostel is located in the heart of downtown Hilo. It's a short walk from the town's popular farmer's market and is close to restaurants, movie theaters, shops, museums, a library, post office, and of course, Hilo Bay. Hilo Bay Hostel is housed in an impressively restored 1913 hotel that has a lot of character and charm. Despite its historic character, the hotel offers all kinds of modern conveniences for guests. There's free wi-fi throughout and nice kitchens which guests can use to prepare their own meals. There's also a large common area where many travelers enjoy hanging out and getting to know each other. The lobby has a television and dvd player, and there's a patio garden if you want to hang out outside. The hostel also offers free parking for those who arrive with cars. There are twin private rooms and eight bed dorms available. The dorms are split by gender and the rooms are quite large. Guests staying in dorms also have access to security lockers for their belongings.